RAPAPORT... A rare oval diamond sold for nearly $14 million at Sotheby’s in Hong Kong Tuesday, beating its high estimate. The oval brilliant-cut, 88.22-carat, D-color, flawless, type IIa stone is one of only three oval diamonds over 50 carats offered in auction history, Sotheby’s said. The hammer went down on it at $13.8 million, or $156,150 per carat, at the Magnificent Jewels and Jadeite sale. It carried a presale estimate of $11.2 million to $12.7 million. The gem was purchased by a private Japanese collector who first saw the stone while it was on display in Japan. He named it the Manami Star, after his eldest daughter. 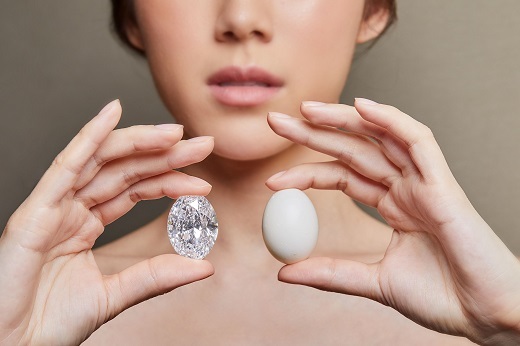 Fashioned from a 242-carat rough stone from De Beers’ Jwaneng mine in Botswana, the 88-carat polished diamond is considered lucky, as the number eight signifies good fortune in Chinese and other Asian cultures, Sotheby’s noted.